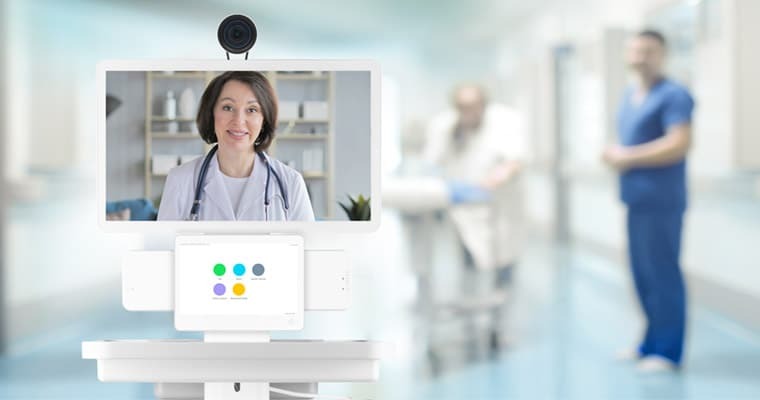 BOSTON – January 22, 2019 – American Well®, a leading U.S. telehealth platform, today announced the launch of a new product, the American Well 760 Cart, which allows acute care teams at health systems to bring remote specialists into the room. The new cart is designed for health systems running telehealth on American Well’s software or on an existing Cisco infrastructure. • Higher performance camera with 20x zoom, increasing image clarity from f/1.5 lens to f/2.8 lens at maximum zoom. The American Well 760 cart is an FDA registered Class I device designed to bring remote specialists into the room to support acute care teams on-site. The cart offers 24/7/365 device monitoring with automated alerts and remote device management. The pan-tilt-zoom camera allows for effortless, far-end camera control and works with a broad range of telehealth accessories and peripherals. Telepsychiatry, where patients can be immediately seen by a mental health professional via the 760 cart and can de-escalate mental health crises, clarify symptoms and provide treatment recommendations. For more information on American Well’s telehealth product line, visit https://www.americanwell.com/telemedicine-equipment/carts/.